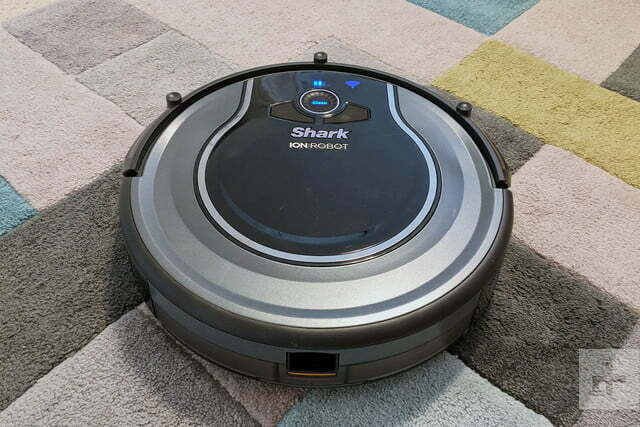 The Shark Ion Robot 750 delivers quite the dusty, hairy bang for the buck. While robot vacuum cleaners have been improving over the years, they’ve yet to find a place in the majority of mainstream homes. Leading brands like Samsung, LG and even Dyson have dabbled with robotics, but the market is dominated by smaller specialists like iRobot , Neato and Ecovacs. Add floor-cleaning, fruit-chopping maestro Shark to that list. The $349 Ion Robot 750 Vacuum tops a range of three models designed to patrol and automatically clean your floors on its travels. Wi-Fi enabled, with mobile app control and integration with both Amazon Alexa and Google Assistant, it’s a thoroughly modern take on a robovac. But will its performance persuade you to sack your regular old upright vacuum? Let’s find out. Shark has opted for a traditional, puck-shaped design (12.6 × 12.6 × 2.6 inches) for the Ion, which helps prevent the robot from becoming stuck when navigating the house but presents challenges with cleaning of edges and corners. To help, two spinning side brushes (one more than some competitors) are equipped to pull dirt and dust into the robot’s path, which gobbles up debris with the support of a removable, self-cleaning brush roll. They’re included in box and snap on quickly. You’ll also find a charging dock, cleaning tool, and Bot Boundary strips, used to prevent the robot from straying into unwanted territories. Clad in smart dark-gray plastics with silver accents, Ion is attractive and feels robust. While there’s nothing particularly revolutionary about the design, care has been taken to ensure the vacuum is simple to manage. Flipping the device over, we particularly liked how Shark clearly marks user-serviceable parts in bright yellow for easy replacement. 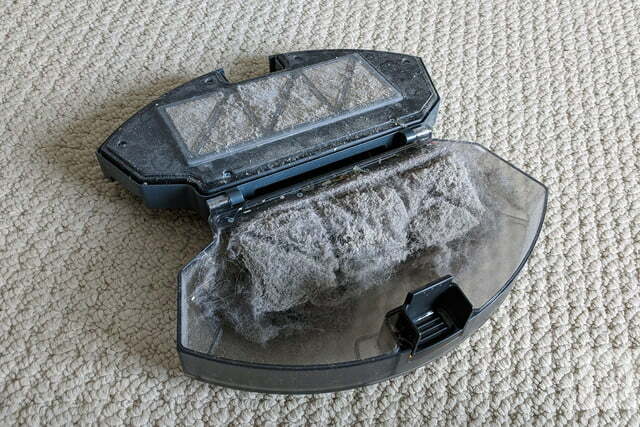 Removing the rear dust pan for emptying and accessing the vacuum’s filter is also a cinch. 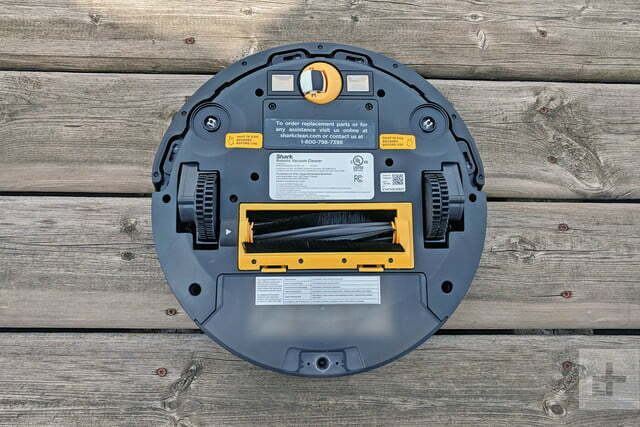 Once charged (it takes three hours), cleaning is toggled by a round cleaning button on the top of the robot. 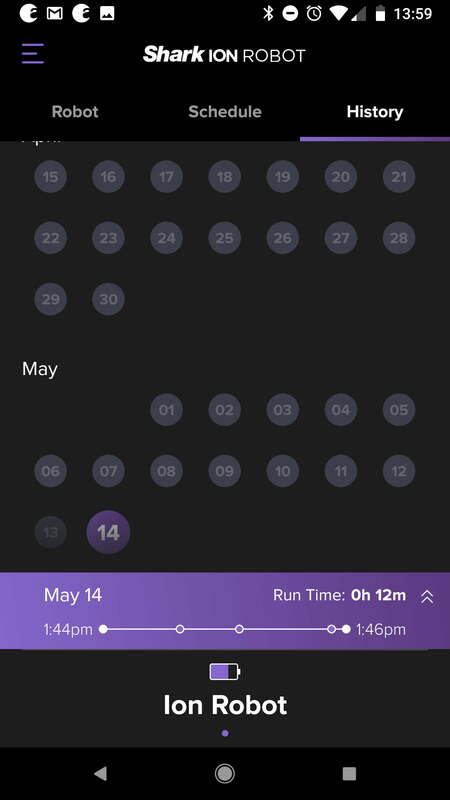 It’s a convenient option if you’re passing by, but launching the Ion from Shark’s mobile app or a voice assistant is quicker and more fun. 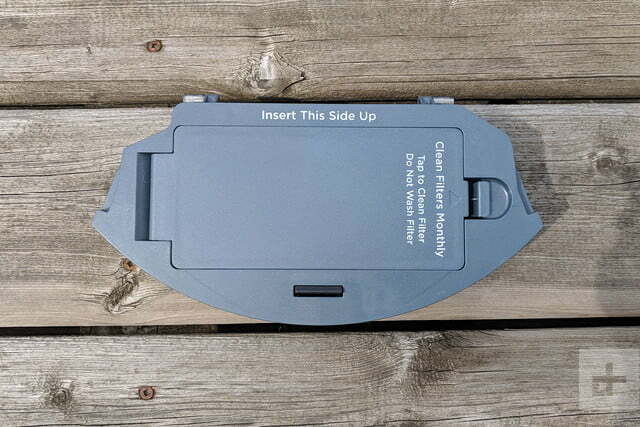 It’s joined by a Dock button, which sends the robot back to its charging station, and a Spot button for concentrated cleaning of a small area. In operation, the Ion robot cleans without too much racket and mostly succeeds in navigating around furniture in the home. We found the device had no problem travelling over rugs and floor thresholds and even managed to avoid some tricky cable hazards. However, we did notice a worrying tendency — the robot ploughed enthusiastically into table legs, sofas and chairs without cause or care. Thankfully, a spring-loaded, rubberized bumper on the front of the device prevents damage, but you may wish to invite the cat to sleep in another room. Clad in smart dark-gray plastics with silver accents, Ion is attractive and feels robust. 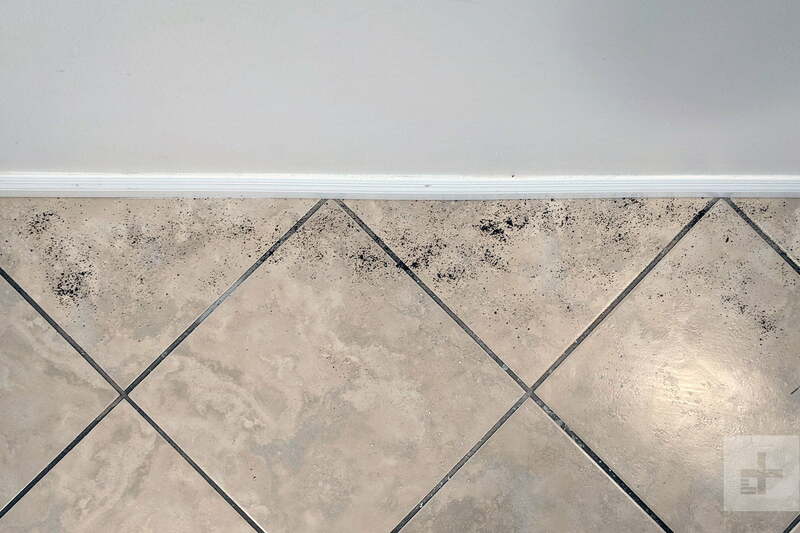 Unlike more sophisticated, camera-equipped robovacs that generate spatial maps of your home, Ion simply relies on an array of proximity sensors to detect obstacles and a lower cliff sensor to prevent falls down stairs. 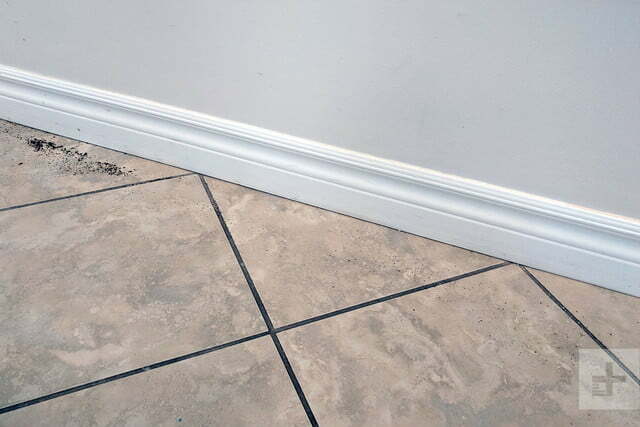 The robot cleans in a random pattern, which isn’t particularly precise – as a result, it may take a few days of cleaning to get full coverage. A lack of mapping also nixes the possibility of accurate recharging and then resuming when the Ion’s battery is low, but the robot will automatically head back to base when capacity is drained. The sensors do a good job of detecting walls, and you’ll see Ion slow and change direction when a perimeter is detected. However, as Ion doesn’t get particularly close to those walls, you’ll need to follow up around your baseboards to zap any gaps. Maneuverability is excellent, however. A free spinning front-wheel and two fixed rear wheels allow the robot to get into and out of nooks that are wide enough to accommodate its width. Just when we thought Ion would be stuck, the robot performed a deft six-point turn to find its way out of trouble. 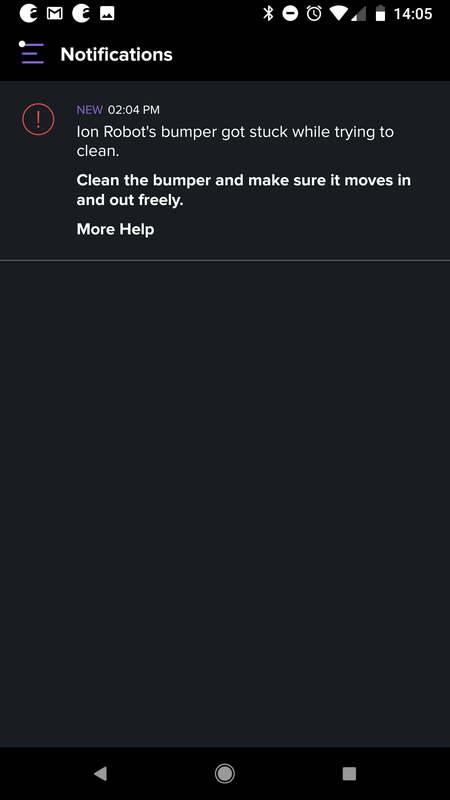 That said, the robot did manage to get stuck once or twice during our tests, alerting us with a cheerful chime and a warning notification in the accompanying app. A quick release, and Ion got back to work. When we started Ion’s first cleaning run, we were immediately concerned by the hushed operation of its vacuum, which could suggest a lack of suction power. The first run took about an hour and, pulling out the dust cup, we were shocked to see just how much dust and pet hair had been picked up in a room that we thought was pretty clean. Okay, it’s no Dyson, but at a third of the price of high-end competitors, the Ion Robot 750 delivers quite the dusty, hairy bang for the buck. Randomized routing and a preference to avoid close proximity with walls meant that Ion didn’t perform so well at the edges of a room. Otherwise, we had few complaints. 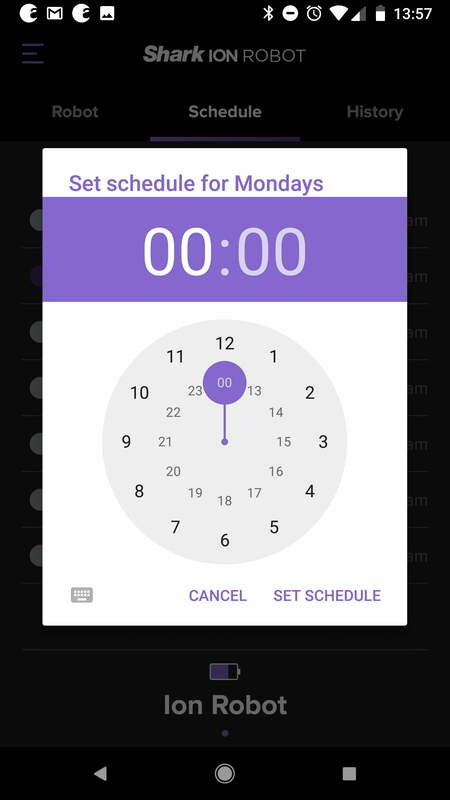 While Ion’s on-device controls are reasonably basic, features are extended with the highly- recommended Android/iOS app, which adds touch-controls, daily scheduling and history reporting, all of which are very simple to use. 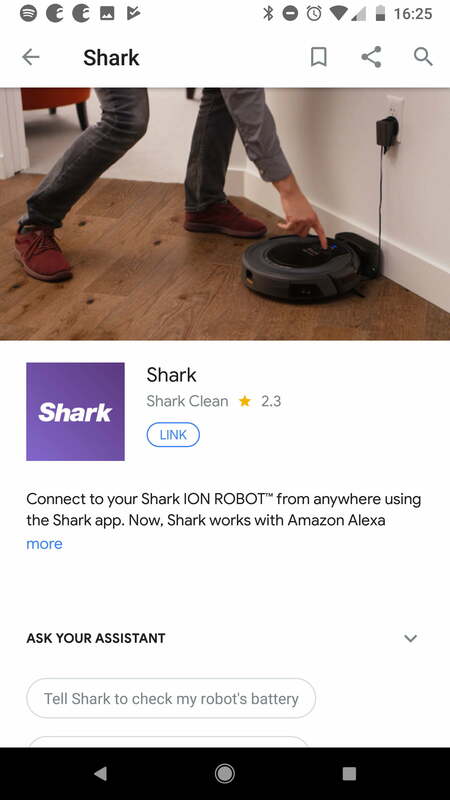 Actions and skills for Google Home and Amazon Alexa similarly work well to start or dock the robot, report status, battery capacity and more – although deeper integration would prevent users from the clumsy “Hey Google, tell Shark to start my robot” phrasing. Fingers crossed that can be addressed in a future update. 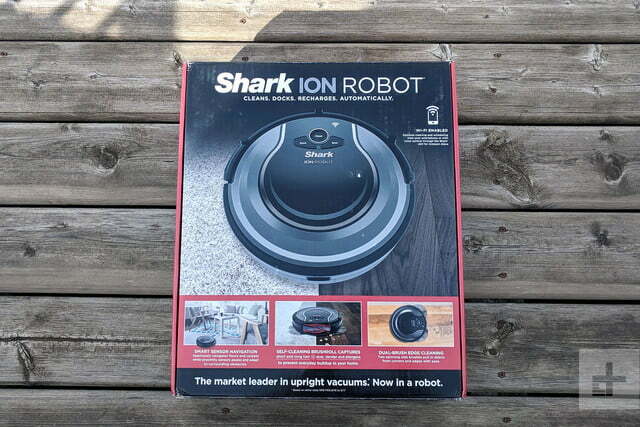 The Shark Ion Robot 750 Vacuum is sold with a 1-year limited warranty. Purchases made directly from the manufacturer may be eligible for an upgraded 5-year VIP warranty. There are undoubtedly more advanced robot vacuum cleaners available than the Shark Ion 750, supporting advanced mapping features, greater suction and better cleaning at room edges. But they come at quite the price. If you want leading-edge tech and premium performance, then this isn’t the droid you’re looking for. For everyone else, this cheerful $349 Wi-Fi-enabled robovac, combining good general cleaning performance with simple and smart controls, is a solid pick. iRobot’s range-topping Roomba 960 offers smart mapping, resume/recharge and improved suction that may well beat Ion Robot 750 in overall performance. But at $699, it’s also twice as expensive. 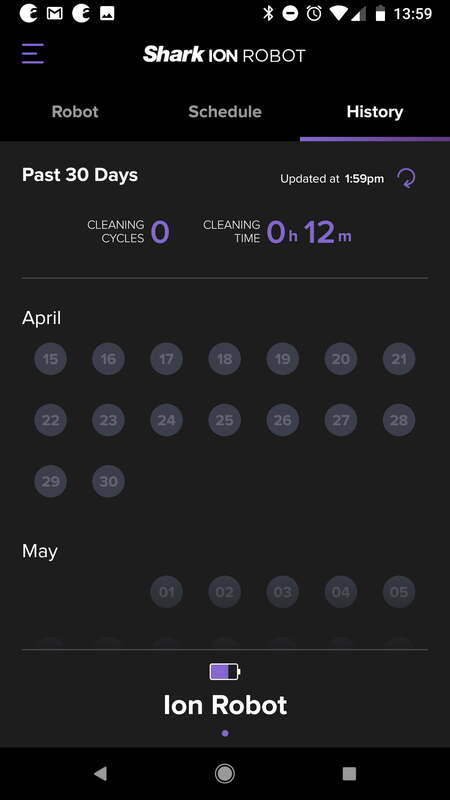 If you’re looking for mopping features, be sure to check out the iRobot Braava Jet 240. A range of budget-friendly parts and accessories is readily available from Shark’s website, which should keep the robot cleaning for the long term – including a replacement Lithium-Ion battery, which will lose capacity over time. Otherwise, be sure to stick to the recommended cleaning and maintenance schedule and you should be able to enjoy years of robo-cleaning. If you’re considering a robovac, start with the great-value Shark Ion Robot 750 before laying out the big bucks on a premium model.